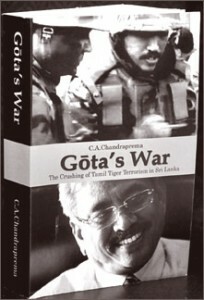 C A Chandraprema’s book on the war against the LTTE is an immensely interesting read. I had wondered how effective he would be as a writer of a sustained narrative, for his columns, though informative, can sometimes be turgid and repetitive. But his book combines a racy narrative with convincing detail, and I think makes clear the immense achievement of the government in dealing with the LTTE. The last of these was particularly important, because the forces had been demoralized previously by the corruption that had become endemic, with officials responsible for procurement using companies run by their families. Unfortunately Chandraprema does not always name names, but I believe a schedule of arms dealers with relationships to government officials, should be made public. The way in which Gota changed the system was impressive, and I recall the tremendous surge of confidence which officers at Diyatalawa, generally amongst the brightest in the Army, evinced when it became clear that arms were being bought for the soldiery, not the dealers and their chums in the forces. I don’t think Chandraprema goes into this question adequately, which is a pity both because of the difference it made to the war, and also because it was a beacon of decency in an increasingly corrupt world. I have long argued that we can hardly blame politicians and officials who do what everyone else around them is doing, given the need for enormous amounts of money that our present electoral and educational systems entail. However, while praying for reform in those areas, we must also register the enormity of financial probity where it occurs, and how in this instance it contributed to efficacy as well as confidence. The meat of the book is indeed the account of the conduct of the war from the time Gota took over as Secretary of Defence, until the fall of Kilinochchi. That section is superbly done, and also balances the brilliance of the military strategy with the political and diplomatic pitfalls that were skillfully avoided. However the description of the final months, though it covers the basics, seems sketchy given the controversies that surround the conduct of the army in that period. I suppose this was not Chandraprema’s purpose, but given his sources of information it would have been useful if he had gone into greater detail with regard to the manner in which the forces held back because of civilians. Unfortunately the scope of the book perhaps meant that the accounts of battles and the taking of territory had to be impressionistic. This had certainly worked in what I would describe as the second part of the book, the description of the war from the time the terrorists took over, which can be dated to July 1983. Though, as Lalin Fernando has noted, there are some alternative interpretations as to details – and again, I too wondered about the relative downplaying of the role of Denzil Kobbekaduwa – on the whole the narrative gives us a fair picture of the relentless downward slide, with the occasional successes promptly undone by changing perspectives and strategies. Chandraprema is also very thorough in his account of the political problems that led to the rise of terrorism, and he does draw attention to factors that are sometimes forgotten by those of us who register the failure of the Sri Lankan politicians to abide by agreements they made. He records the various pronouncements made by Tamil leaders who indicated, rather as R Sambandan has done recently, that their final aim would never alter, and that compromises were only intended to take things forward a little way, with more to follow later. This naturally creates diffidence in those who negotiate with them, and ultimately contributes to bad faith on all sides. But while I think Chandraprema is right to draw attention to these difficulties, he does not do justice to the enormities which led to violence being seen as the only answer to political difficulties. I do not think this is fair on the Armed Forces, who were not I think responsible for what happened in Colombo and other places in the South in 1983, nor for the excesses of 1981, though some individuals may have misbehaved, and were indeed dealt with in a few cases as Chandraprema has recorded. But more serious is the failure to record that the perpetration of violence by state forces was the turning point in giving some sort of legitimacy to the terrorist movements. And even though I believe we have behaved much better since then, and have provided no excuse for terrorism since, we must register that the events of 1983 still continue to reverberate in the psyche of many Tamils. To continue in a state of denial about those events then raises questions about our arguments with regard to recent years, in which I believe we can show conclusively that the state was acting in defence, and that violations of legal and humanitarian norms was almost exclusively the preserve of the terrorists.